The drawings were apparently drawn 10,000 years ago when space travel was not even in the distant dream of human beings. India, the land of a gloriously rich tradition might be once the hottest hub of aliens and extraterrestrial beings. Many historians and archeologists in India believe that cavemen who lived in the pre-historic age have painted pictures of aliens and UFOs in rocks at Charama, Chhattisgarh. Did aliens visit India in the past? These rock paintings discovered in Charama depicts alien-like figures wearing suits very similar to modern space suits. The drawings also feature flying saucers, each with a fan-like antenna and three legs. It should be noted that these drawings were apparently drawn before 10,000 years, an era in which space travel was not even in the distant dream of human beings. Top archaeologists who investigated the site reveal that these paintings were made in natural colors, and they have hardly faded despite the long years. In some of the pictures, the alien-like figures are seen carrying some sort of weapons. Interestingly, people in nearby villages of Charama have the tradition of worshipping small 'Rohela' people who used to land from the sky in round shaped flying saucers. 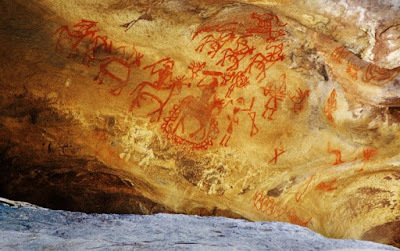 Archeologists in India believe that people in pre-historic ages might have seen aliens either in real life or in imagination, and this might have made them draw such figures on rocks. Apart from this UFO evidence from the pre-historic age, it was on March 15, 1951, that an authentic flying object sighting was reported in India. The incident happened in New Delhi when 25 members of a flying club witnessed a cigar-shaped flying object hovering in the sky. The object was apparently hundred feet long, and after a few moments, it vanished into thin air. Another interesting UFO sighting reportedly happened in 2013 as residents of Mogappiar, Chennai observed five packs of bright orange lights moving across the skies. Apart from these sightings, people who live in the Northern parts of India, especially in Ladakh, and Arunachal Pradesh borders have several times claimed that they have seen UFOs. Apart from the drawings discovered in India, there are various other similar paintings found in other nooks of the globe. Archeologists have previously discovered drawings of alien-like figures at Legends Rock in Wyoming. This site has more than 250 petroglyphs and it clearly indicates that humans in the ancient ages were in touch with extraterrestrial beings. Another mysterious painting discovered in Cayuse Creek in Idaho shows a humanoid figure inside a UFO which resembles flying saucers which we have seen in Hollywood sci-fi flicks. Interestingly, the space vehicle featured in this image is seen emitting trails of smoke behind it. Many people who live in these areas believe that 'Star Men' used to visit humans many generations ago, and these extraterrestrial beings had brought spiritual teachings to our planet.